Soon after I met my husband, he told me about his favorite radio comedy routine ever—a routine done in the voice of a dog who has escaped from home in order to live life as a WILD DOG! Out on the STREETS! Eating wild CANS OF DOG FOOD! My husband cannot recount this routine without laughing hysterically. When I asked him who the comic was, he said: “Daniel Pinkwater.” “The children’s book author?” I asked, somewhat surprised. My husband is a math teacher. He had no idea that Daniel Pinkwater was an author, let alone a longstanding (since the 1970s) children’s author known for his wide-ranging output: picture books, novels, short stories, easy-readers, every single one hilarious. (Not to mention, of course, his works for grown-ups, including both fiction, non-fiction and biography). The next time Pinkwater had a lengthy children’s book come out, I snagged it off the shelf and brought it home to my husband. He disappeared into The Neddiad for days; the same thing happened with its sequel, The Yggyssey. And now there is Adventures of a Cat-Whiskered Girl, a companion book to the stories of Neddie and Iggy, about Big Audrey (a girl from another plane of existence) who does, as advertised, have cat whiskers. Big Audrey’s adventures take her to Poughkeepsie, NY, where she meets a crazy professor of classical accounting, a telepathic Catskill Mountain dwerg, and discovers that there is ANOTHER cat-whiskered girl in our plane of existence—and everyone thinks they are the same person! The delight of Pinkwater’s stories is not so much the plots—though they are entertaining—but the dry way he describes completely outlandish situations as if they are everyday occurrences. Additionally, his dialogue—also dry—is perfectly spot-on; Pinkwater’s books are the sort that you find yourself reading aloud to other people, not just one or two passages per book, but one or two passages per page. The book may be long, and the plot may seem a bit meandering, but when you get to the end, you won’t be able to imagine any part that should have been edited down. And if you can’t find a physical copy of the book, you can read it serialized online on Pinkwater’s website: http://www.catwhiskeredgirl.com/. For that matter, check out his general website: http://www.pinkwater.com/–you can find information on his books, information about him, and enough radio broadcasts and podcasts to make even my husband happy. Thirteen -year-old Kyle and his family always spend the summer at their cottage on a lake in Wisconsin. This year they are going to the cottage but it is different. Kyle’s grandmother has died and Kyle’s father has moved out so he won’t be coming with them. Kyle loves the cabin and is shocked to find out that his mother is planning on selling it in order to add to the college fund for the children. He is very resentful and is very angry with his father. He figures that if his father hadn’t moved out they could still afford the cabin. He decides that with his sisters’ help, they can earn enough to pay the taxes and keep the cabin. He digs and sells earthworms to earn money and then takes a job rowing a neighbor to fishing spots on the lake on most mornings. This is a book about family, about life changes, and about accepting people in spite of their faults. It is also a wonderful evocation of summer vacation at a rustic cottage with family in the seventies – no t.v. and no bathroom, but lots of family time, card games, soccer games, swimming, reading, and fishing. This will be my last blog entry for a while, I am taking some time off. 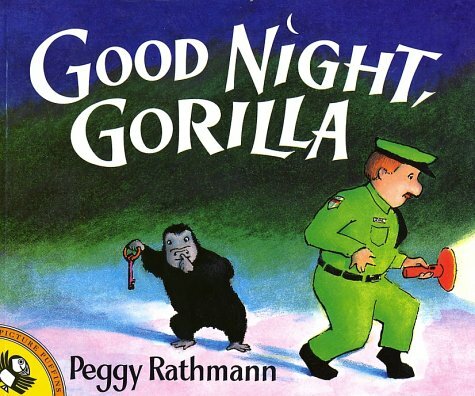 Now that I am a mom, I will be sharing my love of primates with my little one, and a good introduction is the old favorite, Good Night Gorilla. There are few words to this story about bed time at the zoo. One night, Gorilla gets hold of the zookeepers keys, lets his friends out and hilarity ensues. We are looking forward to taking our first trip to the zoo together, and will be sure to read this one several times before we go. Other primate favorites include: Monkey and Me by Emily Gravett, Dear Zoo by Rod Campbell and any of the Five Little Monkeys stories by Eileen Christelow. If you read our review of the book The Billionaire’s Curse, you know how much we like Richard Newsome’s writing. I’m sure you’ll be just as excited as we are to be able to read an interview with him! I’ve always enjoyed writing. I was lucky to grow up in a reading house. There were heaps of books and magazines and a good local library in town. English was always my favourite subject at school and I was lucky to have a string of excellent teachers who kept me interested and challenged. I wrote my first ‘book’ as an English assignment in grade 8. My teacher, Mr Morse, gave everyone an exercise book and a deadline. We were to fill that book with a story and hand it in at the end of the year. I loved that challenge and found myself picking up the book and adding bits to the story during any spare moment I had. I think it got a pretty good grade — I’d love to re-read it now, just to see what my 12-year-old self was like as a writer! My first job was as a journalist on my local newspaper. And there can be no better grounding for a want-to-be novelist than working as a cadet reporter. You get to see and experience so much real world activity that the average Joe on the street doesn’t get to see. So I guess if the whole novel writing thing falls in a hole, I can go back to writing real stuff. Or open a pizza kitchen. I make a very good pizza. How long did it take from finishing your first book to when it was actually published? Did you get many rejections? From the first day I started writing my book, to seeing it on a bookstore shelf took … ten years! Eight of those years were spent doing the actual writing, mostly in my spare time. But I stuck at it and finally got it done. The book was rejected by about 13 literary agents, until I saw an article about a publisher running a competition to find new children’s and Young Adult writers. I entered, won the prize and The Billionaire’s Curse has now been sold into nine countries, including the US, Canada, Germany, Spain and Italy. I used to work with a guy who was a basketball fanatic. His favourite saying was: ‘At some point, you’re going to have to pull up and shoot.’ I must have written and re-writen the first chapter 20 times. When you’re starting out, the temptation is to finesse everything to the nth degree. I’m now a bit easier on myself, and leave the finessing to the editing stage. And now I’m working to a deadline, as my publisher wants the next book in the series by Christmas. The opening line is a killer. It can stop you stone dead. I now start at the second paragraph and write the opener a bit later on, otherwise I’d never get underway. What inspired The Billionaire’s Curse and other books in the series? Was it classic mystery stories (for the locked room mystery of the diamond theft at the museum) and/or adventures like the Indiana Jones movies (for the booby-trapped crypt). It started out as a bedtime story I was making up for my kids, then it got a bit out of control. I’ve always loved the murder mystery genre. My grandmother was a big Agatha Christie fan and the only reading at Christmas holidays at her house was old yellowed paperbacks of Agatha Christie. Finding the killer was always a big thrill. Even in algebra lessons at school, I’d make x the murderer and set about identifying him. As for the adventure stuff, I put that in there to keep me amused. I really wrote the book as a gift to my 11-year-old self. I have a folder full of ideas for future books. I just need the discipline to do it all a bit faster. Go for it. Never think you’re too young or haven’t got enough experience. The best advice is to read widely and critically. Get a library card. Make the librarian your best friend. Take their suggestions and try new books that you might not naturally pick up from the shelf. Don’t just read for the story — think why the writer has structured the story the way they have; why they’ve taken a particular character’s point of view. Not much appears in a book by accident. Try to get behind the writer’s thinking. Hmm. This week it’s ‘funicular’. Last week it was ‘extrapolate’. Can you tell us anything about the sequel to Billionaire’s Curse? Hard to pick one out, but I am a big fan of Evelyn Waugh for his satire of England ‘between the wars’. With kids books, it is impossible to go past Roald Dahl. No one has come within the same zip code as him when it comes to writing for kids. I guess Agatha Christie was there in the back of my head, but I didn’t consciously lean on any one author. I occasionally pulled a book from the shelves just to see how a proper writer might structure a dialogue or a scene, but otherwise I was making it up as I went along. I used to do a bit of running until my right knee exploded one day. But as a stay at home dad with three kids, there’s not a lot of spare time for hobbies, sadly. Writing used to be my hobby. Now it’s my job. Which is pretty cool. Now I need to find another hobby. Thank you so much to Richard Newsome! And now, if you’ll excuse us, we’re going to go read that sneak peak chapter . . . .
My most concise summary of this book would be: Hogwarts for spies. As this book started, I kept comparing it to the Harry Potter books because that is what it felt like the author was trying to create, just with spies instead of wizards. Danny Caulfield ends up at a mysterious spy school called Wilsons. The school itself seems to defy logic with corridors that seem straight yet take you to different floors and other unusual features. The students at Wilsons each have unique abilities. Danny is looked at with suspicion due to his rather unusual facial features, yet he does find a few friends among the students. He even has special talents that set him apart from the others, and set him on a course to his destiny. There are evil forces plotting in the background, and characters at the school who you can’t tell if they are good or bad. Yet for all that the story did seem to have many parallels to the Harry Potter books, it is a unique story and an intriguing start to a proposed trilogy. Spying involves treachery and betrayal. But is that always a bad thing, especially if it is done for the right reason? If you gain some enjoyment and pleasure from those activities, are you just a good spy or are you edging over to becoming evil? These are some of the issues that Danny must deal with as he infiltrates the core of the enemy and must make decisions which may betray his friends and classmates. Are his mentors at the school doing good in their own twisted way, or are they working for their own, or other, purposes? The story comes to some resolution with enough unsolved issues to have readers looking forward to the next book in the series. 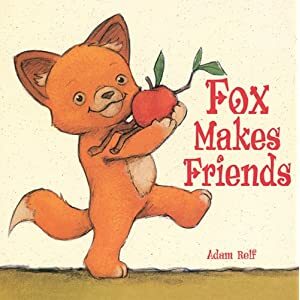 This large format picture book tells the tale of a little Fox who goes out to make some friends. First he tries putting some sticks on an apple, but that doesn’t work. Luckily, a little squirrel and then a rabbit come along to help him make bigger friends, but none of the friends they make will play with or talk to them. It is only when Fox’s mom comes along that she is able to show him that he made friends, just not the way he expected. A charming and delightful book with large cute illustrations. Great for one on one reading or large audiences.